Efficiencies in mapping are also evident through the entire certification processes in Burkina Faso, Tanzania, and Zambia, demonstrating that MAST is a scalable tool. There is much debate about the extent to which our prolific use of mobile technology affects our lives. While the broader debate rages on, the results on how smartphones can lead to improved development outcomes is becoming clearer. For example, a recent study in Ghana found that smallholder farmers’ mobile phone ownership and use significantly improves agricultural productivity when also combined with provision of extension services, and enhanced market participation. Land tenure and property rights is another emerging area where mobile technology can enhance development in powerful ways. USAID’s Mobile Applications for Secure Tenure (MAST) initiative is empowering rural communities to define, map, record, and document their land and resources. MAST combines participatory approaches and mobile technology platforms with on-the-ground training to engage communities to map and document land and resource rights through efficient, transparent, and accurate processes. Significantly, these communities are applying this technology more efficiently than more traditional methods and at scale. The MAST approach is comprised of easy-to-use mobile phone and tablet applications, combined with a robust data management platform, which captures and manages land information that can include names and photos of the people using and occupying land, details about what the land is used for, and information regarding occupants’ claims to land. In addition, on-the ground training of community members builds their capacity to document and manage information about land and resource rights, while participatory approaches ensure that communities understand those rights. In Burkina Faso, the MAST approach proved to be roughly nine times faster than traditional methods. With MAST tools in hand, and in partnership with the community members, the country’s Rural Land Service required only four months to complete the process of mapping 2,638 parcels in four villages, with verifications averaging 30 minutes each. In comparison, using traditional methods, the same authorities mapped only 3,706 parcels over a four-year period. By working in tandem with community members—especially youth—MAST enables citizens to map and document their own land and resources in less time, while promoting community autonomy in land tenure processes. For instance, MAST has been implemented on a variety of time scales; the technology can be deployed to map an area intensely for a short time, or more gradually over longer periods of time. Paired with community ownership, this means that the technology is flexible enough to meet the needs of the community. 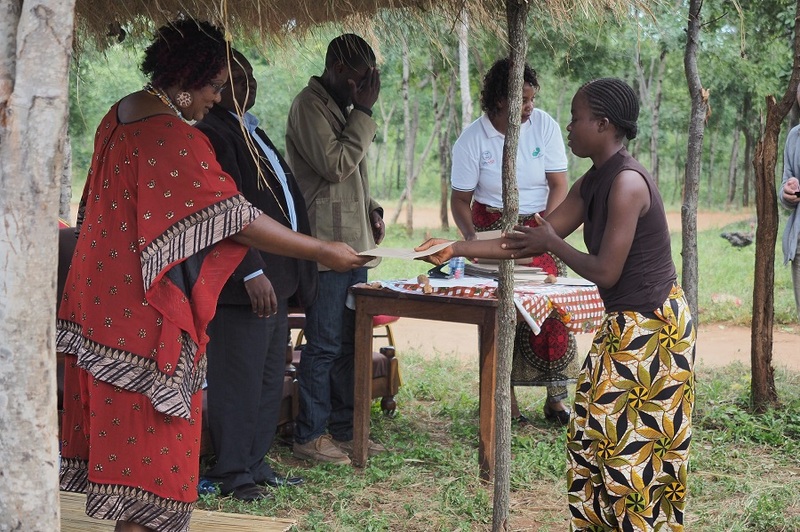 Chieftainess Mkanda distributes land certificates documented through MAST in Zambia’s Eastern Province. Photo: USAID Tenure and Global Climate Change Program. Efficiencies in mapping are also evident through entire certification processes in Burkina Faso, Tanzania, and Zambia, demonstrating that MAST is a scalable tool. As MAST implementations scale up, the duration between demarcation and certification shortens. MAST allows the certification process to become more efficient as time passes. In contrast, traditional processes generally do not become more efficient over time because of their reliance on older technologies, significant labor, and time-intensive manual processes. Thus, despite MAST having higher upfront costs related to adapting or customizing the technology suite to specific land tenure context, its significant efficiency gains over time have allowed implementers to leverage mobile tools and citizen-centric approaches for replication and scaling regardless of the context. Ultimately, the MAST approach is not only a rapid and scalable tool, it also becomes more efficient over time as users become familiar with the technology. And this means that land documents get in the hands of the landholders even sooner. Haruna Issahaku, Benjamin Musah Abu & Paul Kwame Nkegbe (2018) “Does the Use of Mobile Phones by Smallholder Maize Farmers Affect Productivity in Ghana?”, Journal of African Business, 19:3, 302-322. Issifou Ganou, Medard Some, Raymond Soumbougma, and Anne Girardin, Using Mobile Phones, GPS, and the Cloud to Deliver Faster, Cheaper, and More Transparent Land Titles: The Case of Burkina Faso. Paper prepared for presentation at the “2017 WORLD BANK CONFERENCE ON LAND AND POVERTY,” The World Bank – Washington DC, March 20-24, 2017.